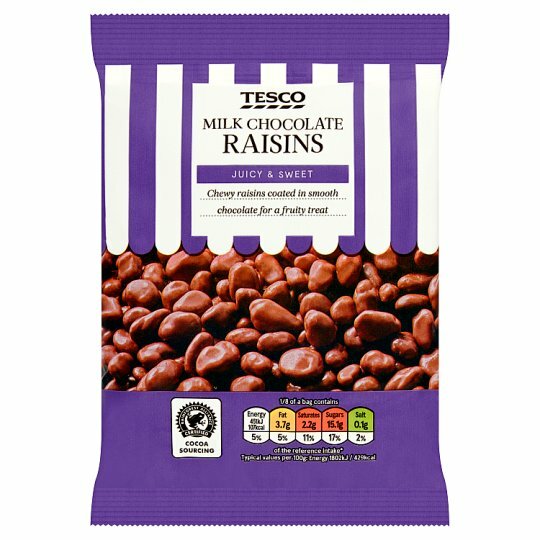 Tesco Milk Chocolate Raisins JUICY & SWEET Chewy raisins coated in smooth chocolate for a fruity treat Our chocolatiers have been creating chocolatey treats in North Yorkshire for decades. We source just the right ingredients from across the world, and bring them all together for you to enjoy. INGREDIENTS: Milk Chocolate (55%)[Sugar, Cocoa Butter, Dried Skimmed Milk, Cocoa Mass, Whey Powder (Milk), Milk Sugar, Butteroil (Milk), Emulsifier (Soya Lecithins), Flavouring], Raisins (43%), Acacia (Water, Glazing Agent (Acacia), Sugar, Glucose Syrup, Palm Kernel Oil, Acidity Regulator (Citric Acid), Preservative (Sorbic Acid)), Sunflower Oil, Glazing Agent (Shellac). May contain peanuts, almond, brazil nut, cashew, hazelnut, macademia nut, pecan and pistachio. For allergens, see ingredients in bold. Also, may contain peanuts and nuts.